Sulphide, derived form sulphate-reducing bacteria in the pore-water of anoxic sediments, forms relatively insoluble compounds with various trace metals. These metal sulphides can be liberated from wet sediment by treatment with 1 N hydrochloric acid (HCl). Sediments containing an excess of this "acid volatile sulphide" (AVS) over "simultaneously extracted metals" (SEM) are characterized by very low pore-water metal concentrations, as well as low metal bioavailability and toxicity. The theoretical foundation of this equilibrium-partitioning (EqP) derived AVS/SEM concept is that trace metal sulphides with a lower solubility product than Fe and Mn sulphides form naturally, and so displace iron and manganese, whenever entering the sediment. For this reason, divalent metals appear in pore-waters in reverse order of their affinity to AVS: Cu > Pb > Cd > Zn > Ni. Consequently, by simply comparing molar AVS concentrations to the molar sum of "simultaneously extracted metals" (SEM), sediment quality values can be defined. This hypothesis was validated by a multitude of laboratory and field experiments, including freshwater and marine sediments and corresponding test organisms. In particular, it was shown that the molar AVS/SEM ratio could predict toxic effects independently of sediment characteristics. Identification of sediments not likely to be toxic, based on A VS/SEM and pore-water concentrations, turned out to be extremely accurate, while prediction of sediment toxicity is more delicate and, at least, demands the use of the organic-carbon-normalised A VS/SEM model. Both the US EPA and the European Commission have now proposed the SSEM/AVS ratio, or the SSEM-A VS difference, as a measure for the bioavailability of at least the metals Cd, Pb, Cu, Ni and Zn. And yet, a critical review of the most recent research indicates certain operational drawbacks and a lack of method selectivity, which have not been adequately addressed so far, and call for further research . The A VS method may rather over- than underestimate the bioavailability of metals, because the used acid digestion also leaches metals from non-sulphidic phases, indicating its rather conservative nature. However, some recent studies also show that certain sulphides are not dissolved and that high portions of metals (like Zn and Pb) may not be present as sulphides in the sediment, despite existing high reactive concentrations ofAVS in the pore water. From laboratory studies we also know that some sulphides dissolve rapidly, while others appear unaffected by sediment oxidation, e.g. upon resuspension. Artifacts may occur by the subsequent reaction of HCl-soluble metals with H2S released during AVS extraction, and their re-precipitation as metal sulphides, resulting in artificially lower SEM values. That extracted Fe in some cases may be higher than extracted AVS also indicates the simultaneous presence of other Fe fractions, like oxides and carbonates. For NiS and CuS, a correlation has been observed between extraction efficiency and surface area, which may indicate that also dissolution kinetics is important. Thus, conventional metal sulphide extractions are not as straightforward as many researchers still believe them to be. Though the SEM/AVS concept proves useful to predict the potential bioavailability of certain metals, our ability is still limited to extend these predictions to a whole series of environmentally relevant metals. Nonetheless, its predictive power with regard to the non-toxicity of both anoxic and oxic sediments has been clearly demonstrated. New scientific data point to the fact that other routes of exposure, like ingestion of contaminated food, or heterogeneity of the sediment around exposed animals, occurrence of microhabitats, adsorption to surface membranes, variable animal behaviour, in addition to the specific experimental design, or the choice of biological response to assess bioavailability, may additionally explain the deviating results observed in more recent tests, when compared to those from previous AVS studies. We also learn that burrowing organisms ingest sulphide-rich sediment, while bivalves filter and retain particles in the digestive tract, making sulphide chemistry of metals in the pore-water less relevant for explaining the actual metal exposure to these organisms. In addition, we know that surface-burrowing worms irrigate their burrows with oxidized overlying water and, thus, enhance their potential pore-water exposure through gills or surface membranes, beside their ingestion of sediment. It should be kept in mind, however, that any metal that is present in the pore-water has the potential to form non-bioavailable metal complexes with other pore-water ligands,e.g. organic molecules, thereby reducing the metal's potential for toxicity. More fine-scale sampling techniques, like DGT ("diffusive gradients in thin films") make it possible now to document the release of metals from solid phases in discrete locations within the sediment to an extent that was not possible to measure by conventional sediment or pore-water sampling techniques. Can the toxicity of metal-contaminated sediments be predicted? specific nature of contaminant bioavailability, when attempting to derive technically defensible sediment quality criteria (SQC) with a broad applicability (Ankley et al., 1996). This challenged the start-up of numerous scientific investigations, first, some fundamental, nowadays classical, studies during the 1980s (e.g. Kemp & Swartz, 1986; Tessier & Campbell, 1987), and later on, an impressive series of systematic studies during the 1990s, starting with the basic finding by Di'Toro et al. 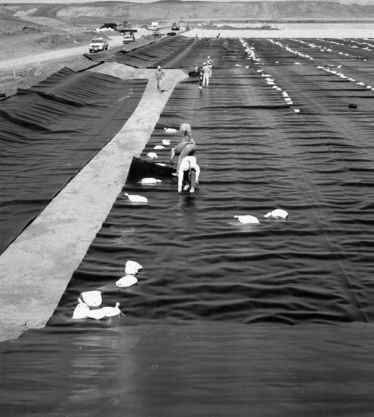 (1990) that AVS plays a significant role in determining the toxicity of metals in anoxic sediments. Over the years, there have been various proposals to establish sediment quality criteria (SQCs) or standards for protecting benthic communities from metal toxicity. Many of those attempts have focused on measurements of total concentrations of each trace metal in the sediment, and comparing these with corresponding background values, or in some cases where available to an effects-based endpoint (see, e.g., Sullivan et al., 1985; Persaud et al., 1989). However, an important limitation to these types of approaches is that causality between metal concentration and biological effect is difficult to establish because values are based on total rather than bio-available metal concentrations. Thus, for any given total metal concentration, adverse toxicological effects may or may not occur, depending upon the prevailing physicochemical sediment characteristics (Ankley et al., 1996). In 2000, it was clearly stated at a meeting between sediment scientists that "empirical methods based on total dry weight metals concentrations in sediments should not be used to predict the toxicity from sediment-associated metals ". The question may arise, if equilibrium partitioning is a sound scientific base for predicting sediment toxicity from metals? The phenomenon of differential bioavailability of contaminants across various sediment types was thoroughly examined with regard to non-ionic organic chemicals at a workshop held in 1984 by US EPA (Battelle, 1984). It was observed that the toxicity of the organo-chlorine pesticide Kepone was not predictable based upon total sediment dry weight concentrations, but the toxic effects of the pesticide were strongly correlated with its interstitial (pore-)water concentrations. In the case of Kepone, it appeared that pore-water concentrations were controlled by partitioning of the organo-chlorine pesticide to organic carbon in the sediment. This observation was important for the recommendation that equilibrium partitioning (EqP) be pursued as an approach for deriving SQC (Battelle, 1984). The EqP approach for predicting bioavailability of non-ionic organics has received extensive peer review, including two assessments by the EPA Science Advisory Board. As a result of the review, this method was recommended as the best currently available for deriving SQC (see e.g. US EPA, 1992). Recently, USEPA has evaluated the potential utility of the EqP approach for deriving SQC for metals. Some initial studies by Swartz et al. (1985) and Kemp & Swartz (1986) supported the concept by confirming that toxicity of cadmium to amphipods (benthic crustaceans) in marine sediments could be accurately predicted based upon pore-water concentrations of the metal. However, at the time, the sediment partitioning phases controlling pore-water concentrations of metals were not readily apparent. As mentioned above, considerable research has focused upon elucidating sediment partitioning phases controlling metal bioavailability, e.g. through the use of elaborate sequential extraction procedures (see Tessier et al., 1979; Luoma & Bryan, 1981, and Tessier and Turner, 1995). It was established that key binding phases for metals in sediments include iron and manganese oxides and organic carbon. However, an important shortcoming with the early approaches of investigation was that much of the work was done with sediments that had intentionally, or unintentionally, been oxidised through procedures such as sample drying. Thus, the techniques were appropriate only for examining metal bioavailability in oxidised sediments. This resulted in an underestimate of the importance of metal-sulphide binding in the anaerobic horizons characteristic of many if not most natural in-place sediments (Ankley et al., 1996). Since it is well-known that sulphide is generated in anoxic layers of sediments through the activity of sulphate-reducing bacteria, it appeared necessary to take into consideration the formation of relatively insoluble sulphides of a number of metals of environmental concern (e.g. cadmium, copper, mercury, nickel, lead, silver and zinc). Thus, Di Toro et al. (1990) investigated the significance of sulphide partitioning in controlling metal bioavailability in marine sediments spiked with cadmium. These researchers used the definition of Cornwell & Morse (1987) to identify the fraction of amorphous sulphide, commonly termed "acid-volatile sulphide" (AVS), available to interact with cadmium in the sediments (see in particular section 5.4.4). "AVS" is defined as the sulphide liberated from wet sediment by treatment with 1N HCl acid. Five to ten grams of the wet sediment are usually treated with 150 ml 1 N cold HCl for 60 minutes. In their studies of cadmium-spiked sediments, Di Toro et al. (1990) found that when the molar concentration of AVS in the test sediments was greater than that of cadmium (i.e. when the cadmium-to-AVS ratio was less than 1), pore-water concentrations of the metal were small and no toxicity was observed in 10-day tests with crustaceans. These results from experiments with marine sediments were later confirmed in studies with cadmium-spiked freshwater sediments (Carlson et al., 1991). Based on these initial studies, Di Toro et al. (1992) suggested that metal SQC could be derived by directly comparing molar AVS concentrations to the molar sum of the concentrations of cationic metals extracted together with the AVS (i. e. SEM = Simultaneously Extracted Metals; the sum of SEMs). This postulate attracted a great deal of interest, and several studies were designed by various groups of researchers to further explore the validity of the ratio SEM / AVS in predicting metal toxicities, including metals such as cadmium, copper, nickel, lead and zinc (Green et al., 1993; Casas & Crecelius, 1994; Pesch et al., 1995; Berry et al., 1996). The overall conclusion was that, as in previous studies, significant toxicity to benthic animals did not occur when AVS concentrations exceeded those of SEM. It was also noted that pore water metal concentrations usually were extremely low when AVS concentrations exceed SEM contents. A series of sediment titration experiments with a variety of anoxic marine sediments were carried out by Casas & Crecelius (1994) in order to assess the response of the sediments to increasing Cu, Pb and Zn concentrations and to critically examine the metal-spiking concentrations that caused an increase in pore-water concentrations. The experiments showed that the formation of metal sulphides with solubilities lower than that of the iron mono-sulphide was favoured. Cu, Pb and Zn were scavenged by AVS and retained in the sediment until the AVS was saturated. The AVS and the binding-capacity values of Pb and Zn were similar, but the binding capacities of Cu were much greater than the AVS values indicating that also other sites may be important for binding Cu in sediments. Subsequent bioassay experiments verified that it was possible to predict the toxicity of Pb, Zn and perhaps Cu to the polychaete worm Capitella capitata in anoxic sediments. Another useful tool for predicting metal toxicity in these sediments turned out to be the ratio between pore-water concentration and the LC50 value for each metal (Casas & Crecelius, 1994). The theoretical foundation for EqP-theory based SEM/AVS predictions of metal toxicity is that the sulphides of cadmium, copper, nickel, lead and zinc all have lower sulphide solubility product constants than do the sulphides of iron and manganese, which are formed naturally in sediments as a product of bacterial oxidation of organic matter. As a result, these metals will displace iron and manganese whenever they are entering the sediment (Di Toro et al., 1992). Because the solubility product constants of these sulphides are small, sediments with an excess of AVS will have very low pore water metal concentrations, and no toxicity due to these metals should be observed (Berry et al., 1996). Thus, the question asked by the well-known eco-toxicologist S. Luoma in 1989: "Can we determine the biological availability of sediment-bound trace elements ? ", had received at least a provisional, positive answer. • non-toxic sediments having metals/AVS ratios of >1.0 may have low pore-water metal concentrations, less than those known to be toxic in water-only tests, or/and metals are scavenged by additional sediment binding phases or AVS contents are very low. The appropriate fraction of metals to use for AVS normalisation is the SEM, i.e. the metals which are simultaneously extracted in the cold acid used in the AVS procedure. This fraction is appropriate because some metals form sulphides which are not fully labile in the short time required for the AVS extraction (e.g. nickel and zinc) (see section 5.4.3.3). Toxicity predictions based on sulphide binding would use the sum of the molar concentrations of SEM for the divalent trace metals present (Cd, Cu, Ni, Pb and Zn) for comparison with the molar concentration of AVS in the sediment. If the sum of the SEM is greater than that of AVS, metals may occur in the pore-water in sufficient concentrations to be toxic. If the toxicity of the cationic metals in the pore-water is assumed to be additive (see e.g. Spehar & Fiandt, 1986), it should be possible to predict the toxicity of the sediment in the same way as in the individual metal experiments, using the sum of the pore-water toxic units or "interstitial water toxic units" (IWTUs). ratios slightly >1.0, followed by zinc, cadmium, lead and copper as the concentration of metals increases relative to that of AVS (or as AVS is exhausted) (Ankley et al., 1996). Exactly this trend was, in fact, observed to occur in metal-spiked laboratory sediments studied by Berry et al. (1996). Simpson et al. (2000b) found that adding Cd, Cu and Zn to a polluted sulfidic estuarine sediment resulted in the quantitative formation of CdS, ZnS and Cu2S (not CuS!). When the sedimenary AVS (FeS) was exhausted, added Cu displaced Zn and Cd from their binding phases, as did Cd for Zn, confirming that AVS is the most reactive binding phase in anoxic sediments. However, in oxidised marine or freshwater sediments, where sulphide partitioning is not fully controlling metal bioavailability, other partitioning phases may be more important. The key binding phases for metals in such sediments include iron and manganese oxides and organic carbon. Any specific sample of natural sediment (e.g., a sediment core) is a complex microcosm with more or less sharp gradients of pH, red-ox potential, total organic carbon (TOC) and, consequently, also of AVS. Therefore, the most important partitioning phases for metals may vary considerably between different sediment layers, and hence, the toxicity of sediment metals. Due to the above mentioned sediment complexity, and hence the difficulties of predicting sediment metal toxicity based on knowledge of even a great number of sediment characteristics, it has been claimed for some time, that direct determination of the metal concentration in sediment pore-water (interstitial water) would be a more efficient method for predicting sediment toxicity. However, it is also known that the toxicity of the metals in pore-water may be modified by dissolved organic carbon (DOC) and by other ligands as well (see e.g. Winner & Gauss, 1986). Summarizing studies to test the "AVS hypothesis"
1. Toxic effects of contaminants in sediments may be predicted by comparison of concentrations of contaminants in interstitial waters of sediments with existing data on effects in water-only exposures (e.g., from U.S. EPA water quality criteria). 2. Factors that influence the partitioning of contaminants between dissolved interstitial water (IW) and solid phases in sediments can be used to normalise sediment concentrations to their bio-available fractions. The EqP approach incorporates the hypothesis that AVS limits the activity and therefore the bioavailability of metals in anoxic sediments. The AVS-metals hypothesis uses the relative concentrations of two operationally defined classes of components, AVS and SEM, to predict whether metals in sediments may occur as dissolved species in the pore-water and, thus, are likely to be biologically available. It should, however, be kept in mind that the entire quantity of a trace metal dissolved in IW (interstitial water) may not necessarily be bioavailable, since complexes with soluble ligands may not pass biological membranes. A decade of research, mainly in the USA, has defined and tested this hypothesis. During this extensive research campaign, several research groups (many of which were associated with the U.S. EPA) investigated various aspects of the hypothesis relating AVS and SEM with the bioavailability of trace metals by applying a wide variety of procedures and tests. The trace metals tested included Cd, Cu, Ni, Pb and Zn, both individually and in mixtures. Some of the experiments were conducted on field samples, while others used metal spiked sediments or samples collected in the field with gradients of contamination by metals and AVS. Results have been obtained from many kinds of marine and fresh-water sediments, with respect to their short-term or long-term (e.g. life-cycle tests) toxic effects in tests with various benthic invertebrates (e.g. amphipods, polychaetes, oligochaetes, insect larvae, snails and daphnids) and fish (rainbow trout) (Kemble et al., 1994; Casas & Crecelius, 1994; Berry et al., 1996; Hansen et al., 1996a; Liber et al., 1996; and Sibley et al., 1996). • Each of the tested sediment samples, collected from a river system contaminated by mining activities, contained a complex mixture of metals such as As, Cd, Cu, Pb and Zn. Whole-sediment tests were conducted in the form of long-term exposures (up to 28 days) of four test species (an amphipod, a midge larva, daphnids and rainbow trout). Divalent metals in sediments with molar SEM/AVS ratios <1.0 were not predicted to be bio-available (Kemble et al., 1994). (i) AVS is a key factor controlling the behaviour of some metals in sediments. (ii) AVS is the appropriate parameter to be used for normalising Pb and Zn in anoxic sediments. (iii) AVS may not be the appropriate parameter to use for normalising Cu in anoxic sediment, as binding capacities of Cu were much greater than the AVS values, implying that also other sediment binding sites are important. (iv) The SEM-to-AVS molar ratio is useful for predicting Pb, Zn and perhaps Cu toxicities to the polychaete worm Capitella capitata in anoxic sediments. (v) The IW-to-LC50 ratio is also a useful indicator of metal toxicity to C. capitata in anoxic sediments. • Six separate experiments were conducted in which two or three sediments with varying AVS concentrations were spiked with a series of concentrations of Cd, Cu, Ni, Pb or Zn or a mixture of four of these metals. The amphipod Ampelisca abdita was then exposed to the sediments in 10-d toxicity tests. The results demonstrated that it is not possible to predict the toxicity of sediments spiked with metals using the total metal concentration on a dry weight basis. The relationship between mortality and total metal concentration in the tests was sediment specific. In contrast, the relationships between mortality and SEM/AVS ratio and between mortality and IWTUs were demonstrated to be sediment independent in the studies with the amphipod. Therefore, it was believed that the use of SEM, AVS and pore-water measurements of metals in combination are superior to all other currently available sediment evaluation procedures to causally assess the biological implications of these five metals associated with sediments (Berry et al., 1996). • In a paper, where results from all experiments (till that date) using field-collected saltwater and freshwater sediments were combined with those from all available laboratory spiked-sediment tests using a wide variety of saltwater and freshwater species, Hansen et al., (1996a) further studied the relationship between total metal concentrations, IW metal concentrations, and SEM/AVS ratios and toxicity to the saltwater amphipod A. abdita, and compared these with previously published results. Predictions of sediments not likely to be toxic, based on SEM/AVS ratios and IWTUs for all data from freshwater or saltwater field sediment and spiked sediment tests turned out to be extremely accurate (93.3 - 100%) using either or both parameters. While predictions of sediments likely to be toxic were less accurate (19.4 - 79.1%), this approach was deemed to be very useful in identifying sediments of potential concern (Hansen et al., 1996a). • In a field-validation experiment with zinc-spiked sediments in a natural pond, bioassays were carried out with the midge Chironomus tentans and the amphipod Hyalella azteca and field colonisation by benthic invertebrates was followed. Sediment samples were taken five times during a one year period and the abundance of different taxa (chironomidae, oligochaeta, nematoda and bivalvia) was evaluated. No substantial effect on colonisation of zinc-spiked sediments by benthic macro-invertebrates was observed. Only oligochaetes (Naididae) were significantly reduced in abundance in the highest zinc treatment for two out of the five sampling dates. The AVS concentrations in the sediments generally displayed low temporal variability, especially in samples spiked with high concentrations of Zn, and there was a positive correlation between AVS levels and SEM Zn concentrations in the sediments, suggesting that natural metal sulphides (e.g. FeS and MnS) had been replaced with the more stable (less susceptible to oxidation) ZnS. Overall, AVS normalisation was useful for predicting non-toxicity (i.e. when molar SEM/AVS ratios were <1.0), but prediction of toxicity was complicated by additional metal binding phases, such as organic carbon, and by differences in the sensitivity of benthic macro-invertebrates to Zn (Liber et al., 1996). • An evaluation of the AVS model with respect to its potential to predict metal toxicity during long-term exposure to a spiked sediment was conducted using a life-cycle test with the midge C. tentans. The results confirmed those of short-term studies, i.e. when the SEM/AVS ratio was <1.0, the concentration of Zn in the IW remained low and adverse effects on survival, growth or reproduction were not observed. Conversely, when the molar SEM/AVS ratio was >1.0, elevated levels of Zn appeared in the pore water, leading to reduction in survivorship, growth, emergence and reproduction. Thus, the study supported the use of AVS as an important normalisation phase for predicting toxicity in metal-contaminated sediments (Sibley et al., 1996). A further refinement of the hypothesis relating AVS, SEM and bioavailability of trace metals, where special attention was given to the vertical and temporal variation of these parameters, was made to account for natural processes in field sediments. To assess the significance of these variations in field sediments, a long-term experiment in which sediments spiked with Cd, Cu, Ni, Pb and Zn were deployed in the sea and recolonisation by benthic organisms was investigated (Boothman et al., 2001). The sediment initially contained about 9 ^moles AVS/g dry sediment, and in order to obtain conditions ranging from excess sulphide to excess metals, equimolar quantities of the five metals were added to sediment in nominal total metals / AVS -ratios of 0.1, 0.8 and 3.0 to 1 (0.1 X, 0.8 X, and 3.0 X). During the experiment, the AVS concentration in the surface layer (03 cm) decreased significantly, except in the 3.0 X sediment, due to the formation of the less soluble metal sulphides from reactive FeS. In the high metal dose experiment, in turn, SEM decreased due to diffusion of excess SEM from the pore water into the overlying water. In the subsurface layer (6-10 cm) no decrease of AVS with time was detected. Also the excess metals ([SEM] - [AVS]) clearly decreased with time in the surface sediment layer. On day 119 of the experiment, sediment cores from the different treatments were collected and sectioned in 0.6 cm intervals to allow profiles of metals and AVS to be determined with finer resolution. While the AV S concentrations usually decreased in the top 2 cm (except in the 3.0 X series), AVS typically increased at all sediment depths below about 2 cm in all treatments. Unlike sulphides, the profiles of SEM showed little change in cores below 2-3 cm. Much like AVS, however, metal concentrations decreased substantially in surface sediments down to almost 3 cm depth. The core profiles finally showed that AVS exceeded SEM throughout the sediment column in all but the 3.0 X treatments. In the highest metal treatment, excess metals ([SEM] - [AVS] > 0) were found particularly in the deeper layers (below 3 cm), where SEM exceeded AVS by 10 ^mole/g or more. In sediments less than 2 cm deep, though, excess metals were less than 4 ^mole/g in all samples and less than zero in some. Thus, it was expected to find metals in IW in the deeper sediment layers, but that metal concentrations in IW in surface sediments should be low or non-detectable (Boothman et al., 2001). Analyses of IW demonstrated that Cu was not detected in any of the 22 samples investigated. Cd and Pb were detected in a few samples from the 3.0 X series. However, after 119 days, the only metal detected in the IW in the surface (1-3 cm) sediment was Ni, while Ni, Cd and Zn appeared in the subsurface (7-9 cm) sediment IW. Thus, the magnitude of the metal's concentrations followed the order of solubility of their sulphides, i.e. Ni > Zn > Cd > Pb > Cu. Metal concentrations in IW decreased with time for all metals except Cu (because Cu was always below detection limit). Despite this decrease, however, concentrations of all added metals (except Cu) exceeded their chronic water quality criteria (U.S. EPA, 1998) for at least the first 56 days, Cd and Zn for up to 85 days and Ni for the entire experiment. The concentrations of Ni exceeded the chronic criterion by two to three orders of magnitude throughout the experiment. The assessment of the results of the benthic colonisation of the sediments showed that the colonising communities in the 3.0 X series were very similar to those in the control sediments and also similar to the ambient community. Major phyla were identical, the most abundant being Annelida (primarily polychaetes) and Mollusca. Species composition and - in most cases - organism density were also similar in metal-amended sediments and control sediment. Thus, increasing concentrations of metals added to the experimental sediments, within the limits used in the present experiment, had no detectable effect on the benthic communities (Boothman et al., 2001). These field experiment results apparently contrasted with what was found in similar cadmium spiking experiments carried out in the laboratory (Hansen et al., 1996). In the latter, higher concentrations of excess Cd were associated with decreased species richness, decreased size, abundance and diversity of polychaetes, absence of bivalve molluscs and greatly reduced density of diatoms. Closer examination of the experimental conditions in the field experiment showed that the apparent discrepancy between the chemical composition of the sediment and the biological response most probably was related to the spatial scale of the chemical measurements and the nature of benthic colonisation. Metal concentrations in IW were measured by integrating the sediment layers between 1 and 3 cm deep and between 7 and 9 cm, respectively, while SEM - AVS was measured at every 0.6 cm on day 119. Since the measure of excess metals in the uppermost sediment layer indicated that no bio-available metals would be present, this result was consistent with the biological data, but the result from the analysis of metals in the IW was not fully representative, because of the low precision in describing the vertical distribution of interstitial metals. This fine-tuned vertical distribution of bio-available metals is important for the interpretation of the biological effects, since the colonisation of a sediment, devoid of infauna, obviously starts at the top, and the relatively small organisms that are the first newcomers, mainly stay in contact with the surface sediment layer. Only at a later stage, larger and/or burrowing organisms, which will exploit deeper layers of the sediment, will become exposed to metals in the IW at greater depth. It should also be noticed that the discrepancy between the laboratory (Hansen et al., 1996b) and field experiment (Boothman et al., 2001) is probably due to the fact that metals that are released from the uppermost sediment layer are readily washed away by bottom currents occurring in the field situation, but obviously not in the laboratory (see section 5.4.6). This may counteract the build-up of toxic concentrations of bio-available metals in the very surface of the sediment, where the first colonisation by benthic organisms takes place. Because biological response to contaminant exposure appears to be very sensitive to the vertical distribution of contaminants, appropriate techniques should be used to obtain sediment samples from the portion of the sediment column inhabited by the relevant organisms (see section 5.5.3) (Boothman et al., 2001). In the cited study, colonisation of benthic organisms was related more to [SEM] - [AVS] in the upper 1 to 2 cm of sediment than to concentrations of metals in IW at depths of 1-3 cm. The authors considered this to be an artefact of using a sampling device with inadequate vertical resolution; peepers (such as the dialysis-type in situ devices developed by Hesslein (1976)) with better vertical resolution might have revealed gradients of concentrations in the IW. In general, it seems that meta-stable iron and manganese sulfides can act in the sediment as buffer for the oxidation of metal sulfides (e. g. due to bioturbation), also to form highly reactive surfaces for the adsorption of free metal ions released from the pore water, emphasizing the rather conservative nature of the AVS approach. That the temporal and spatial occurence of AVS and SEM changes in the sediment, due to seasonal variations, diagenetic processes and the acitivity of sediment-living organisms, should not be underestimated, as it can change metal bioavailabilities and so transform formerly non-toxic sediments into toxic, and vice versa. goes beyond the binding capacity of the organic carbon present in the sediment. The authors use marine field sediment data from Long et al. (1998) (reference given), who compared the capability of empirically derived SQG and the SEM/AVS method to predict organism mortality observed in field-collected sediments. When drawing up the available data on a log-normal scale, the authors found that both methods, i. e. the average ERM2 ratio (ERMR), or the ZSEM/AVS, are not very useful to predict sediment toxicity. For the average ERM ratio, the uncertain range, where no statistically significant mortality (at a 24% level) was observed, included more than 55% of all data, while for the ZSEM/AVS ratio the predictive power was even less. Mortality was even observed at SEM/AVS ratios of less than one, which contradicts the AVS-concept. Later, it was shown that the observed toxicity was not due to metals, why the authors conclude that the AVS concept will fail in field sediments where metals are not the only cause of the observed toxicity. The authors continue to evaluate literature data from toxicity tests using laboratory-spiked marine and freshwater sediments, now including the organic carbon fraction, in addition to the marine field data. When they again compare organism mortality with the average ERM ratio, it became clear that it is not feasible to reliably predict toxicity in these spiked sediment samples by the ERM methods, as the uncertain range included more than 75% of the data. However, the statistical evaluation of the metal-spiked sediment data confirmed that the SEM/AVS ratio could reliably predict the lack of toxicity at SEM/AVS < 1, with an uncertain range covering only 28% of the data. Also when Di Toro et al. (2002) combine the spiked and field-collected samples and compared the average EMR and SEM/AVS ratios to the observed mortality, again the ERM ratio failed to present reliable predictions, in contrast to the SEM/AVS method, which succeeded to reliably predict the absence of metal toxicity in these sediments. But to reliably predict also the ocurrence of toxicity at SEM/AVS > 1, so the authors conclude, the theoretical basis must be further improved. where fOC is organic carbon fraction in the sediment, and KOC the organic carbon based partition coefficient. To evaluate critical metal concentrations Koc LC50, the authors suggest to use the term (SEM - AVS)foc as toxicity predictor, based on measured SEM, AVS, foc and toxicity data. When comparing the mortality of the spiked and field-collected sediments to unnormalized excess total SEM (ESEM - AVS), the uncertainty range still covers about 37% of the data. However, when the organic carbon normalized total excess SEM concentration is used, the range of uncertainty to predict toxicity could be reduced to only 26% of the data, which corresponds rougly to the value predicted by the SEM/AVS ratio. Surprising for the authors was the fact, that organic carbon normalized excess SEM concentrations can be apparently applied to all the sulfide forming metals (Cd, Pb, Ni, Zn) tested, except for Cu (for which no non-toxic data for positive excess SEM values are available) and Ag (due to the particular role of sulfur-containing ligands for Ag complexation). Concerning the ability to even predict chronic toxicity, the authors further compared data from tests with metal-spiked sediments to organic carbon normalized excess SEM. In fact, the obtained results suggest that the lower boundary, i.e. ZSEM < 150 ^mol/gOC, where no acute toxicity was found, is also the boundary below which no chronic effects may occur, in contrast to the uncertainty range of the observed acute toxicity, where chronic effects occured. From this, the authors draw the conclusion that the threshold level for chronic effects may be at ZSEMxOC = 150 ^mol/gOC. From the EqP equation ZSEMX>OC = KOC LC50, and the corresponding KOC values found for the metals Cd, Cu and Pb, the authors calculate the range for the toxicity threshold (32 - 100,000 ^mol/gOC) and compare it to the much narrower range found by using the organic carbon normalized excess SEM concentration (150 - 3400 ^mol/gOC). From the narrower range, the authors conclude that there may be an inverse correlation between LC50 and KOC, which would mean that metals with lower LC50s also have a higher KOC. The negative correlation between KOCs and LC50s suggests, so the authors, that the toxicity of a metal is inversely related to its affinity for organic carbon, as expressed by its partition coefficient, a relationship, which may bridge the gap to another toxicity predicting model, the Biotic Ligand Model (BLM) (see chapter 6). According to the BLM, the toxicity of a metal (to fish and crustacea) is controlled by the binding strength of metal ions to a biotic ligand (like respiratory membranes), and by the critical biotic ligand concentration required to produce mortality. If the binding strength, so the authors further rationalize, to that biotic ligand is proportional to the binding strength to organic carbon, then metals with a low KOC would tend to have a high LC50, and vice versa. The applicability of the SEM/AVS model was also recently evaluated by establishing Receiver Operating Characteristics Curves (ROC) to compare different approaches/models that estimate the toxicity of metals in sediments (Shine et al (2003). The focus was to test the capability of a method to correctly classify a toxic sample as toxic and a non-toxic sample as non-toxic. ROC curves were constructed by using acute toxicity data from 357 samples chosen from eight sources including freshwater and marine sediments. Species tested were Hyalella azteca, Chironimus riparius, Neanthes arenaceodentata, Capitella capitata, Lumbriculus variegates, Helisoma spp., Ampelisca abdita and Chironomus tentans. Both the negative and positive predictive capability was examined. From this analysis it became clear that the SEM/AVS model provides an adequate negative predictive power of 97 %, but a low positive predictive potential (of 55 %). As the latter means the likelihood that a sample exceeding the threshold is in fact toxic, toxic effects are not observed in a large number of cases exceeding the SEM/AVS ratio. This is not surprising since both the SEM/AVS threshold of 1, and the SEM-AVS threshold of zero, are not considered to predict toxicity, but intend to provide information about the absence of metal-related toxicity in sediments. AVS-based sediment quality values (SQVs) are currently considered as sediment quality guidelines by the regulatory community. Extraction techniques using cold HCl to measure the concentration of sulphide mineral associated trace metals are widely accepted as a proxy for the potential metal bioavailability in sediments (see references given in Landner 2002, and Reuther 1999). The fundamental principle of the AVS theory is built upon the assumption that in sulphide-rich sediments trace metals are predominantly present as sulphide phases and that non-sulphide binding phases like hydroxides, carbonates or organics are insignificant. It is further assumed that the analytical AVS procedure extracts particularly monosulphides and that for every mole of AVS sulphide a mole of metal measured as SEM (Simultaneously Extracted Metals) is extracted. This is in fact in agreement with many experimental findings that metal ions added to anoxic sediments form discrete metal sulphides. Based on this equation, it is assumed that aqueous metal concentrations should not build up and hence sediments are supposed not to be toxic to benthic invertebrates (with regard to metals), as long as there is sufficient FeS(s) available in the sediment to complex all SEM. Only at molar SEM/AVS ratios > 1, no FeS will be available to sequester metals, which now can build up toxic porewater levels. So far the widely accepted theory. However, recent research gave new scientific evidence to question some basic assumptions of the AVS concept (see below). So, since its introduction in the 1990s as a tool for practical risk assessment of contaminated sediments, it has been shown that the SEM/AVS concept still has some operational drawbacks and an obvious lack of selectivity. It became in particular clear, that the HCl-extraction does also dissolve (or not) in a rather unpredictable way some other sulfides in the sediment. The most common way to measure SEM/AVS is to digest sediment at room temperature for 1 h in either 1 or 6 M HCl. The evolved hydrogen sulphide is trapped in a basic solution by a Soxhlet apparatus, the sediment slurry filtered and the filtrate analyzed for metals. The molar ratio of the acid volatile sulphide (AVS-sulphide) to the simultaneously extracted metals (SEM-metals) is consequently used to predict sediment toxicity (see section 5.4.3.1). Comparing SEM to AVS, either by ratio (XSEM/AVS) or by difference (ESEM-AVS), as a measure of bioavailability was proposed by the US EPA for the metals Cd, Pb, Cu, Ni and Zn. In a recent study, O'Day et al. (2000) re-examined the theoretical support for the SEM/AVS approach, which is based on the following assumptions: (1) these 5 metals precipitate from porewater as monosulphides and SEM measures total metal concentrations associated with these sulphide phases, (2) AVS is formed by iron sulphides including mackinawite (Fe1+xS), greigite (Fe3S4), and amorphous FeS, and maybe minor quantities of ZnS, PbS, NiS and CdS, and (3) pyrite does not dissolve and contribute to the AVS metal pool (see section 5.4.3.3 for more details). Sediments with ^SEM/AVS > 1 (or £SEM - AVS > 0) are interpreted as potentially toxic because HCl-extractable metals exceed the amount of reactive sulphide, assuming that FeS is insufficient in the sediment to react with dissolved metals in the porewater to form less soluble monosulphides, and so precipitate metals from solution. But increasing studies show that the AVS method is not selective, and SEM and AVS are rather operationally defined, including not only easily extractable and sulphidic phases, but also other non-sulphidic metal-binding compounds in the sediment. This chemical non-selectivity adds to the fact that the AVS concept is supposed to be a rather conservative measure of both metal bioavailability and/or toxicity in anoxic sediments. Cooper and Morse (1998) found that some metals may be present in sulphides poorly soluble in cold HCl, whose solubility is rather subjected to surface area effects. For example, it was particularly shown for NiS that HCl extraction efficiency decreases with decreasing surface area (i. e. increasing grain size). A similar trend was also demonstrated for CuS for the 1 N HCl extraction (see Table 5.6). Studies by Cooper and Morse (1998) examined the solubility of pure trace metal sulphides indicating that the AVS concept may be most successfully applied to Zn, Cd and Pb contaminated sediments. Laboratory experiments could document that sulphide minerals, like covellite (CuS), chalcocite (Cu2S), cinnabar (HgS), millerite (NiS), heazlewoodite (Ni2S3), and vaesite (NiS2), are only poorly soluble in HCl, in contrast to greenockite (CdS), mackinawite, pyrrothite (FeS), galena (PbS) and spaelerite (ZnS), which proved to be highly HCl-soluble (see Table 5.7). Although these synthetic minerals do reflect a rather artificial situation, which rarely may occur under real field conditions, the results show that HCl-based extraction methods may in some cases even underestimate the potential bioavailability of certain metals, like Cu, Hg and Ni, in anoxic sediments. We also have to keep in mind that this particular method has even less relevance for oxidised sediments. Here, a high bioavailability will be predicted due to low AVS values, although we know that additional binding phases, like organic carbon and Fe/Mn oxyhydroxides, cause low metal bioavailabilities, thus confirming the rather conservative nature of the method. However, and despite these limitations, the US EPA has recently endorsed the AVS concept as the best available test scheme to date to assess the bioavailability of the above mentioned 5 metals, due to obviously existing "strong theoretical foundations" (O'Day et al. 2000). In the following, we will give some further examples to further indicate some shortcomings of the AVS concept, which have been recently found. It even may turn out that the assumptions made so far, may not be justifiable for the 3 metals mentioned before (namely Zn, Cd or Pb). For example, when these metals were added to sediments as metal powder, oxides or solid salt, they did only slowly react with the available porewater sulphide. For this reason, Simpson et al. (2000a) assumed that high portions of Zn and Pb may not be present as sulphide despite high reactive sulphide (AVS) concentrations were measured in the porewater. If sulphide coatings would limit sulfidization of oxidized metal surfaces, which are soluble during the AVS-extraction, an excess of SEM over AVS would be observed, although such SEM would be actually unavailable. Potential toxicity would be falsly predicted. Caution is therefore needed also here, when extrapolating laboratory results (e. g. from spiking with metals) to studies with naturally contaminated sediments. We also now know that some metal sulphides releasing metals into a more bioavailable phase do not extract in HCl. Simpson et al. (1998) showed that 1 M HCl (30 min) extracts H2S, amorphous FeS, mackinawite (FeS1-x) and some greigite (Fe3S4), but no pyritic sulphides from the sediment. Simpson et al. (2000a) detected that some model sulphides (CdS, FeS, MnS, ZnS) dissolved rapidly in 1 N HCl (30 min), whereas others (like PbS) dissolved less rapidly (in contrast to the experiments by Cooper and Moore, 1998) and appeared even unaffected by oxidation (e. g. upon resuspension). Again, CuS and NiS dissolved not at all in 1 HCl, and only a minor part (15 and 10 %, respectively) became oxidized after resuspension. These metals seem strongly bound to sulphide even under high acidities (i. e. high HCl concentration). The authors could also document a significantly slower oxidation rate for HS- than for FeS and MnS and consequently suggest an increasing sulphide oxidation in the presence of metal ions. It is generally assumed that the rapid oxidation of Fe2+ by oxygen produces Fe3+, oxygen radicals and peroxide, the latter characterized by a higher oxidation capacity than oxygen. Further, Fe2+ may itself initiate a catalytic process, where "FeS in the presence of oxygen catalizes the oxidation of itself'. These oxidation processes are much surface- and pH-controlled with elemental S0 as a major oxidation product (with maximum rates for MnO2 at pH 5, for Fe(OH)3 at pH 6.5 and for FeOOH at pH 7). Also experiments recently done by Sundelin and Eriksson (2000) confirmed that even a strong sediment oxidation (during 3-7 months) did not succeed to significantly alter the bioavailability of AVS-bound metals, like Cd, Zn and Cu, in anoxic sediments, despite AVS was reduced, suggesting sulphidic metal-binding phases less soluble in 1 M HCl, in addition to other binding ligands, like organic carbon (see section 7.2.3.1, below). The determination of SEM by 1 M HCl sediment extraction was also recently questioned by the studies of Mikac et al. (2000) for the insoluble sulphide forming metals Cu, Ni and Hg. Preextraction spikes were simulating the behaviour of metals dissolved upon HCl extraction and recovery was variable, but much lower for Cu and Hg than for Cd, Ni, Pb and Zn. At least for mercury (Hg) it was shown that HCl-soluble metals may react with H2S released from AVS during extraction and re-precipitate as metal sulphide (e.g. HgS), resulting in seemingly lower acid-soluble metal concentrations and hence SEM. However, Hg precipitation artifacts became less significant at low sediment-AVS. Also sulphide precipitation was considerably lower at higher (2-6 M) HCl concentrations. The difference between 1 M and 6 M HCl in extracting Hg from an anoxic sediment was 15 % and 50-60 %, respectively, of the total Hg, questioning the use of 1 M HCl at least for extracting Hg in the presence of AVS. As neither the HCl-insoluble nor the HCl-soluble Hg fraction was extractable by 1 M HCl, its use at least for the partial extraction of Hg in sulfidic sediments is highly questionable. More intriguing, there are studies reporting that a general formation of discrete trace metal sulphides does not take place even in anoxic sediments (references given therein). From this, Mikac et al. (2000) conclude that developing extraction methods for known individual metal sulphide phases will be essential to test these informations. Their studies also showed that similar amounts of the metals Fe, Mn, Zn, Cd, Ni, Cu and Pb are extractable by the employed HCl concentration range. Comparable concentrations of Fe and Mn liberated by 1-6 M HCl suggest that always the same sediment phases have been extracted. But as extracted Fe was about 23 times higher than extracted AVS, the existence of other Fe fractions, like oxides and carbonates, was indicated. Morse (1994) (reference given in Mikac et al. 2000) exposed anoxic sediments to oxic seawater and found that the HCl-extractable fraction increased 3-fold within 24 h, most probably due to metals trapped within a sulphide phase not soluble in HCl, but potentially oxidizable into an oxide form, which was then soluble in HCl. Based on their results, Mikac et al. (2000) admit that conventional metal sulphide extractions are not as straightforward as still many researchers believe them to be. There is increasing evidence by previous studies that HCl-extraction may only assess a more general degree of metal sulphide association, and possibly not metal fractions of Cu, Ni and Hg included into pyritic phases. In addition, the relation observed between extraction efficiency and surface area for NiS and CuS indicates that dissolution kinetics may play an important role for these metals and have to be considered when designing more appropriate future extraction schemes (see Table 5.6). Further, incomplete dissolution observed for Ni, Cu and Hg sulphide minerals suggests that the total mass of metals may be likewise relevant. From a geochemical point of view, the extremely small concentrations found in natural sediments imply that metal sulphides may exist in a much less crystalline state, possibly not as discrete mineral phases but as coprecipitates with iron, for example. Although there is still a need to improve the predictive power of the AVS concept also for the bio-availability of metals, like Cu, Ni or Hg, the successful use of the HCl-extraction to predict bio-available Cd, Pb and Zn species points into the right direction. When evaluating the potential for sulphide-associated trace metals in estuarine sediments to enter into more bioavailable phases due to major oxidation events, Cooper and Morse (1998) assumed that there is a direct link between the speciation of Fe among sulphide and oxide minerals and the seasonal variability of the flux of total dissolved Cu from the sediment. Released trace metals may become complexed by strong ligands (e. g. DOM), or coprecipitate with Fe sulphides, and/or adsorb to the surface of pyrite or AVS minerals, e. g. when aqueous sulphide reacts with aqueous iron or metastable Fe oxihydroxides (e. g. goethite or lepidocrite) to form solid FeS. Continued dissolution of Fe oxyhydroxide and the low solubility of FeS (mackinawite) may lead to high concentrations of Fe and very low aqueous sulphide in porewaters. The lack of aqueous sulphide and consequently the higher residence time (i. e. availability) of oxygen may in turn make the solid sulphide more susceptible again to oxidation. But without a sufficient supply of oxidants, SO4-reduction may ultimately exhaust the supply of meta-stable Fe oxyhydroxides, increase the HCl-soluble Fe associated with AVS-minerals and possibly lead to an increase of the aqueous sulphide concentration. This may inhibit metal-ligand formation, favour the formation of metal sulphides and allow a rapid pyrite formation and concomitant sequestering of trace metals within pyrite by FeS reacting with aqueous polysulphide or H2S. The authors conclude that by reducing the residence time of oxygen in the sediment, high concentrations of aqueous and solid sulphide can buffer any potential oxidative dissolution of FeS(s) and so help to preserve any trace metals associated with AVS minerals and pyrite in sediments. However, the use of AVS-Fe as a proxy for sediment instability with respect to sulphide associated metals is based on (i) the fact that the AVS extraction does not separate Fe oxide minerals according to their chemical reactivity observed during early diagenesis, and on (ii) the assumption that metals adsorbed to the surface of AVS minerals possess different reaction kinetics than metals coprecipitated within the AVS matrix. Differences in the sulfidization rate of iron oxide minerals will make the degree of sulfidization dependent on the sulfate reduction rate and so again on the concentration of Fe oxide minerals. To give an example, Sonke et al (2002) took organic sediment samples from a nearby peat bog pool, in an attempt to describe the atmospheric history of a former Zn smelter. By means of 'microprobe analysis' they could show that metals brought by atmospheric deposition (probably as oxides) were immobilized by an extensive in-situ FeS2 and ZnS precipitation, suggesting indeed a rapid diagenetic transformation of metal oxides into sulphides. According to Cooper and Morse (1998), the percentage of highly reactive HCl-soluble Fe obtained from AVS analysis can be used as a measure of the sulfidization potential of oxide minerals, and reflects the potential of the occurrence of measureable porewater sulphide. From their results, the authors conclude that a large ratio of "sulfidized" to "oxidized" Fe may indicate that the supply of sulphide exceeds the supply of oxidants (like molecular O2, Fe3+, or metastable solid phase Fe3). In summary they emphasize that the potential of sulphides to trap aqueous metals and to inhibit metal-ligand formation, as well as the potential of these sulphides to be destroyed later upon oxidative dissolution, are key factors for predicting the reactivity of trace metals in aquatic sediments. Accordingly, the ratio of reactive Fe to AVS may represent a more inexpensive and useful indicator for the potential reactivity of sulphide minerals and associated trace metals in marine sediments (Cooper and Morse 1998). Lee et al. (2000a) pointed out the complex, dynamic three-dimensional oxidation gradients, which characterize surface sediments, and reminded of the fact that benthic biota interact with these gradients in a variety of ways to obtain food or oxygen. We know that epifaunal and infaunal animals in anoxic sediments maintain an oxic microenvironment in their burrows and feeding zones, e. g. for O2-respiration and to avoid sulphide toxicity (see section 5.4.6). By means of 18-d laboratory bioaccumulation tests with 5 test species (2 clams and 3 marine polychaetes) selected on the basis of their broad diversity in feeding behaviour and zone, burrowing mode and direct sediment contact, Lee et al. (2000a) tried to simulate and evaluate the effect of realistic metal, AVS and geochemical gradients on the bioavailability of selected trace metals.